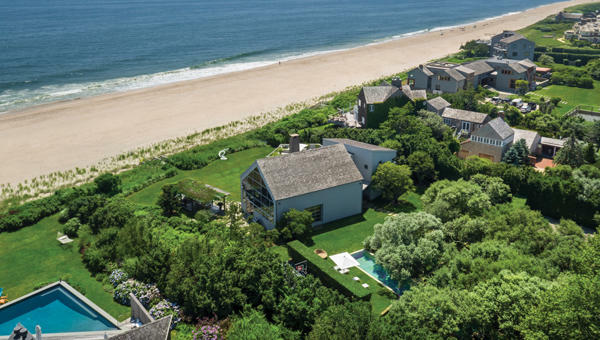 The three-bedroom home at 135 Crestview Lane in Sagaponack was listed at just under $50 million by Justin Agnello and his team at Douglas Elliman. UPDATED: July 2, 1:120 p.m. To keep their edge in the rapidly evolving East End real estate market, Zachary and Cody Vichinsky of Bespoke Real Estate are investing very heavily in technology, including a proprietary database that helps their firm analyze the luxury segment. “We have a very robust marketing division that is myopically focused on systems and marketing methodologies that are specific to $10 million-plus properties,” said Zachary. 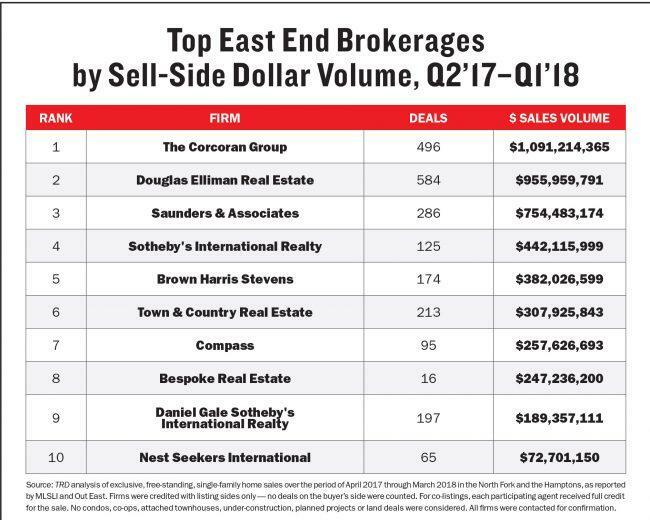 For the second year in a row, the brothers nabbed the top spot on The Real Deal’s annual ranking of the East End’s top brokers, though it should be noted that this year, TRD looked at closed sales dollar volume versus 2017’s ranking based on exclusive listings volume. The brother-broker duo brought in nearly $230 million in sales between April 2017 and March 2018. However, perhaps thanks in part to their myopic focus on ultraluxury, and the fact that the Vichinskys appear to represent every single one of the listings Bespoke brings in, the firm only placed eighth on TRD’s ranking of top East End brokerages by closed deals, bringing in that same $247 million sales figure. Bespoke had 16 deals over the April 2017 to March 2018 period, compared to Corcoran’s 496 and Elliman’s 584, the most of any ranked brokerage. The good news for all the top brokerages is that if the adage “a rising tide lifts all boats” holds true, then things are looking up, as reports indicated that the luxury sector is shaping up to be healthier in 2018. Ultra-high-end sales — the type Bespoke specializes in — are up in the Hamptons so far this year, according to Town & Country Real Estate’s first-quarter report. Four homes have sold for more than $20 million in the first quarter of 2018, compared to just one last year, the report said. Both inventory and buyers are fairly limited at the tippy-top of the market; however, top agents are making plenty selling slightly lower-priced homes. There were 37 sales at or above $5 million, a 37 percent increase over the same period a year ago, according to Douglas Elliman’s first-quarter sales report for the Hamptons. In the luxury market as a whole, which represents the top 10 percent of sales, the average price rose 36.1 percent to $9.1 million, while the median jumped 27.5 percent to $6.6 million. For overall sales, the average price rose 15.2 percent to $1.98 million from the same quarter in 2017, thanks to the uptick in high-end sales, the report said. The median sales price was $995,000. Still, agents say it’s hard out there. “It is a tough market, undoubtedly,” said Beate Moore of Sotheby’s International Realty, which clinched fourth place on TRD’s brokerage ranking with more than $442 million in closed sales. The Corcoran Group took the No. 1 slot with $1.09 billion sold, while Douglas Elliman was close behind with $1.08 billion. “When you listen to the news, I think there is an overall feeling that things aren’t all that great. Then we had a really tough, long winter. That wasn’t so great for the business,” Moore said. The Vichinsky brothers make a point of promoting properties to the wealthiest people in the world: “That’s the ultimate focus … It’s complete dedication to the luxury segment,” Zach said. And specializing in the $10 million-and-up market means sales add up fast. And although that means saying no to a lot of potential listings, the brothers said the benefits “far outweigh” the limitations. But other agents are racking up volume as well. Harald Grant of Sotheby’s landed the No. 2 spot on TRD’s list with almost $140 million in sales, including 86 Bay Lane in Water Mill, a 4.6-acre property on Mecox Bay that sold for $18.75 million. Among his current listings is a 20,000-square foot, sixteen-bedroom property on Meadow Lane in Southampton, priced at $150 million. Susan Breitenbach of Corcoran took the bronze; her more than $132 million earned her the third place on the ranking. Breitenbach’s current listings include a 40-acre waterfront estate on Sagg Pond in Bridgehampton with ocean views, a tennis court and a pool, listed for $35.6 million. Brown Harris Stevens’ Christopher Burnside took fourth place with about $115 million in sales, and Douglas Elliman’s Enzo Morabito was in the No. 5 spot with a total sales volume of more than $111 million. Staying at the top of their game is a constant effort, brokers said, and the uncertainty in the market keeps them hustling, each in their own way. But there is more than one way to get to the top of one of the most competitive markets in the country. Many brokers say there is no substitute for long-standing relationships in the Hamptons market when it comes to making sales. “There have been professional relationships I’ve built over my 38-year career that I can reach back on for guidance and referrals and offer my guidance and counsel in a market that’s changed dramatically in that time period,” said Davis. For her part, Carol Nobbs, a broker at Douglas Elliman, believes there have been fundamental changes in the marketplace. And things move faster than ever. To make sure buyers and sellers are served quickly in an age of instant gratification, and that deals get closed, some brokers are sharing commissions. Nobbs said she is adding agents to her listings to do open houses. Of course, with change often comes uncertainty. And East End brokers and brokerages are seeing some cooling. “The market is, I believe, quite soft out here,” said Justin Agnello, also of Douglas Elliman. He is part of the Atlantic team, with partners Hara Kang and James Keogh; they are currently showing Elie Tahari’s Sagaponack estate at 135 Crestview Lane, which is listed for $45 million. The property, which is about 4,500 square feet, is located on 2.5 acres of oceanfront land. “We haven’t had much action on it,” Agnello admitted. To maintain their edge in this environment, Agnello and his partners, who have worked together for 14 years, personally show the properties they are listing. “Every buyer who walks into the house will ask a question that needs to be answered,” said Agnello. Buyers may not realize, for instance, that it’s possible to clear another quarter acre and put in more yard, he noted — and the broker who is there to address their concerns will have an edge, he said. Elliman’s Morabito mainly focuses on homes closer to the area’s median price. He said his team consistently sells 50 to 60 homes a year. “We do volume,” Morabito emphasized. However, one of his team’s current pricy listings is an eight-bedroom, six-bathroom home on the ocean in Westhampton Beach South, asking $6.9 million. The competition among brokerages is intense, with Saunders & Associates, ranked #3, closing 286 deals adding up to about $754.5 million in sales. Meanwhile, at the bottom of the list, Nest Seekers — home to “Million Dollar Listings” star Ryan Serhant — came in at No. 10, with $72.7 million in sales across just 65 deals. No matter what the price, to get buyers to the properties, social media and tech are playing an ever-greater role for firms and brokers in the Hamptons. Moore, for instance, promotes properties on Instagram and Facebook in addition to putting some of the priciest listings in Sotheby’s auction catalogue and relying on the brokerage’s Referral Network, a global platform. Corcoran now has a group of more than 60 full-time employees who work on technology, said CEO Pam Liebman. They just refreshed the firm’s website, she said, and the firm is launching some new mobile tools for the agents, so it’s easier for them to work from wherever they are. Elliman has also been proactive. To keep up with social media, among other things, the firm just added Samantha Yanks, the former editor-in-chief of Modern Luxury’s Gotham and Hamptons magazines, as chief marketing officer. She’ll direct its digital marketing as well as brand management, creation and positioning. With the firm now operating in California, Florida, Massachusetts, Brooklyn and Long Island, including the East End, and with more than 7,000 agents across 113 offices nationwide, Yanks has been charged with developing and tailoring specific messaging for those markets. She will also lead the agency’s national marketing program and oversee the firm’s “Elliman Insider” blog. “People are so addicted to their phones, it’s almost taking over for email blasts,” said Agnello. Elliman has also invested in its own site, Elliman.com, one of the most highly trafficked real estate websites, the company said. Besides listings, it includes the AskElliman tool, which lets consumers ask questions about homebuying and get quick answers from a team of experts. Morabito, too, sees the value in using newer platforms for advertising. “Right now, social media is the most affordable advertising on the face of the earth,” he said. He likes it that he can target buyers carefully. “We can dial into who we are in front of based on what their preferences are, how much money they make and what types of real estate they are interested in,” he said. Morabito believes that Facebook advertising is the most cost-effective avenue — “I can put it in front of 10,000 people for $150 a week,” he said — and that Snapchat works particularly well for reaching millennials. All of this takes time, and, like Agnello, many agents are outsourcing. Nobbs has been paying a company to do professional Instagram posts for her that feature a 30-second video of the property. Nobbs and other brokers say sellers now expect them to be on top of social media. “You have to accommodate both sellers and buyers in a nanosecond,” she said. Correction: An earlier version of this article provided the incorrect total for Zachary and Cody Vichinsky’s sales as an agent team, and for Bespoke Real Estate as a firm. Both charts have been updated to reflect the revised totals. The earlier version also misstated Douglas Elliman’s total sales volume and number of transactions due to a clerical error.